Shameless Self Promotion: My New Adventure Novel is Now on Kindle! The Unexpected Traveler is now on Kindle! Normally I confine my publishing stuff to the Mt. Sneffels Press website, but I’m just too excited to limit myself to an announcement on only one website! 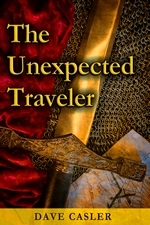 My fantasy epic action adventure novel, The Unexpected Traveler, is now available on Kindle. The introductory price is $2.99. Remember, you don’t have to have a Kindle to read Kindle books. There’s a free Kindle App on the iPad and iPhone, not to mention Android. And, you can always put the free Kindle app on your PC. For more info, see the book’s page on Mt. Sneffels Press, or click here to go straight to the book’s Amazon Kindle page. This entry was posted in Computer Tips, Shameless self-promotion. Bookmark the permalink.